We launched our Pragmatic Clinical Studies (PCS) initiative in early 2014 to expand our support of high-priority, patient-centered comparative clinical effectiveness research, or CER, projects. These large-scale, real-world trials and observational studies address critical questions faced by patients, caregivers, clinicians, and healthcare delivery systems. We created this funding category in response to both stakeholder feedback and our understanding that many key health research questions require a greater investment and longer timeline than our previously established broad funding announcements allow. High-priority research questions for PCS awards may come from several sources. These include topics listed in the 2009 Institute of Medicine Priorities for CER report, the Agency for Healthcare Research and Quality’s Future Research Needs Projects, as well as topics recommended by patients and other stakeholders through PCORI’s topic prioritization process. All PCS funding announcements include a list of such PCORI priority topics. In addition, our PCS funding announcements call for the research community’s best ideas for other high-priority topics. PCS announcements appear three times a year; applicants may request up to $10 million in direct costs. Applicants must provide a letter of intent, or LOI, and we invite approximately 50 percent of these to submit a full application. PCORI staff are happy to discuss potential projects with applicants either before or after LOI submission. The title of our initiative emphasizes that we seek pragmatic studies appropriate for a specific high-priority question. Answering that question must be of great practical value for healthcare decision making, and study findings should reflect everyday care for a wide range of patients. These studies usually take place in real-life practice settings, such as a typical hospital or clinic, and include diverse patients with different needs, circumstances, and preferences. In contrast, traditional clinical studies tend to look at how well care approaches work under ideal conditions, with highly selected patients, in specialized research centers. ​Like other research we fund, pragmatic projects measure benefits and harms to determine which of two or more healthcare options works best for different types of patients. Studies can compare, for instance, drugs, devices, procedures, or delivery-system interventions. All projects must address the range of health outcomes that are meaningful to the patient population under study. These studies often have large sample sizes—sometimes thousands of participants—so they can detect potential differences in effectiveness and outcomes in groups of patients with specific characteristics, an approach known as heterogeneity of treatment effect. We attach high importance to getting the research question right to ensure that important results influence practice and are likely to transform health care nationwide. To do this, we insist that patients, clinicians, and other healthcare stakeholder groups (e.g., payers, purchasers, policy makers) must be meaningfully involved throughout the research process. We typically expect that relevant organizations (e.g., patient groups, specialty societies, or insurer groups) will participate. We are happy to facilitate contact between successful awardees and such organizations. Here are a few examples of the types of potentially high-impact projects funded under our PCS initiative. Breast cancer surgeon and researcher Laura Esserman, MD, MBA, of the University of California, San Francisco, is leading this project, which will compare the outcomes of women who have annual mammograms with those of women who receive mammograms on a schedule determined by their personal risk. The project, known as the Wisdom Study, will involve at least 100,000 women. Find out more. This study—which is targeting 1,300 smokers with severe mental illness—is comparing a program that educates only clinicians to one that combines clinician education with practical community health worker support for both the smoker and the care team to improve the recommendation and use of smoking cessation treatments. The research team is asking how these approaches compare to usual care in helping participants with serious mental illness become abstinent and improve their quality of life. Find out more. Researchers are comparing two commonly used strategies for treating patients who overuse migraine medications. The research team plans to provide migraine preventive treatment to 1,280 patients. Half of those will receive therapy in which they immediately discontinue their overuse; the other half will not immediately discontinue overuse. Find out more. Researchers are seeking to break a vicious cycle—a fall causes an older person to fracture a bone and subsequently limit activities, which further increases the risk for falling. In this study, coaches will supervise exercise by older adults after a fall-related fracture. The researchers will compare 1,000 people who received coaching to a similar group who did not, measuring outcomes—including strength, mood, and emergency care use—that are important to patients, their doctors, and insurance companies. Find out more. 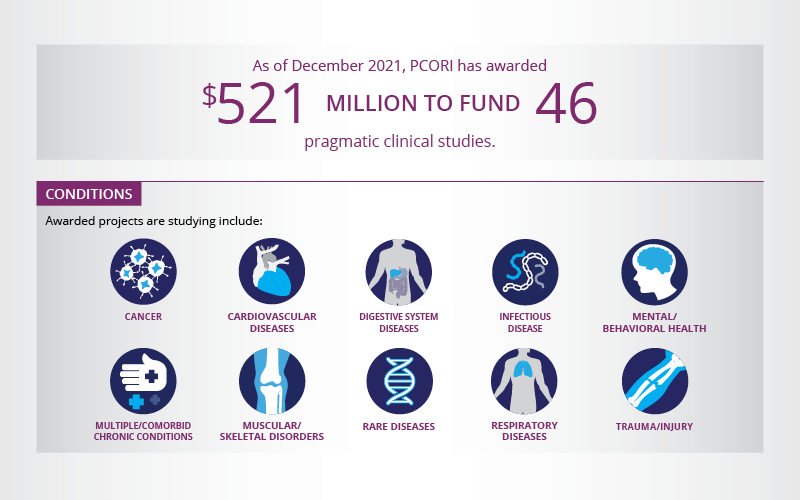 As with all PCORI projects, these studies were approved by our Board subject to a business and programmatic review by PCORI staff and completion of a final research contract.